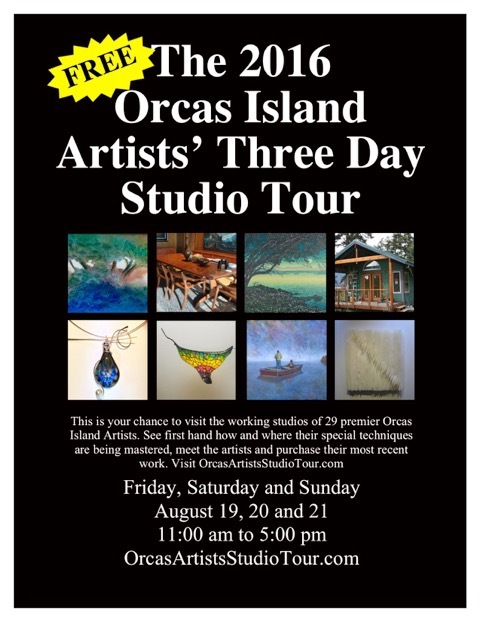 It’s a FREE and easy tour that opens the doors to 29 private Artist Studios on Orcas Island over 3 days this weekend, Aug 19-21, from 11am to 5pm. The 29 Artist Studios all over the island have been busy as the artists give that final polish to their studios in time for the 6th annual Orcas Artists Studio Tour that opens tomorrow. Give these artists a clap on the back and congratulate them for a neat studio when you see them this weekend! Grab a Tour Guide from the Chamber of Commerce office in Eastsound, and pick and choose the artist studios working in the mediums you want to see. Stone Sculptor Dave Haslett, #17 in the guide, and painter at #16, Jan Rimerman, will be all set up outside. Ceramist Sharon Ho, in downtown Eastsound at the Felt+Ceramics Studio, #2 on the tour, just got the last batch of birds out of the kiln. Come see how they turned out! Ceramist Maria Root’s studio, Studio #20 below, is looking bright and cheery. And environmental installation artist Ken Brown, Studio #11 on Channel Road in Deer Harbor, has been out in the field (literally!) getting his wonderful labyrinth in place. You have to experience this in person! Look out for the fish kite that the artist studios will have hanging outside to point you in the right direction. Burgundy Scott, studio #13 on a restored schooner where she makes her opulent seed bead jewelry, is ready for visitors!